This non-lethal weapon was dreamed up by PKD in 1965. "...Frankly, I think we ought to drop a Garbage-can Banger on New Moscow. "It's a missile that wide-cracks in the atmosphere... above the popcen - the population center - which it's aimed at. We place the Judas Iscariot IV above New Moscow, set to wide-crack at half a mile, and it rains down minned - miniaturized - h'd, that means homeostatic -"
"they start. Each pellet, fully cammed, begins to emit a sound... a horrid sneering sound. Buzzing... The point is, it keeps you awake... I mean wide-awake. Once the noise of a Garbage-can Banger gets to you, for example... you never sleep again... You can't perform your job. You're no good to anyone, yourself included." As it turns out, our government is hard at work on the Garbage-can Banger. The long range acoustic device sonic weapon developed by American Technology Corporation is a non-lethal means of crowd dispersal. The device weighs about forty-five pounds and emits its beam from a 33 inch diameter pad (not yet minned). At its maximum volume of 105 dB at 300 meters, it creates an intolerable noise similar to that of a smoke detector. 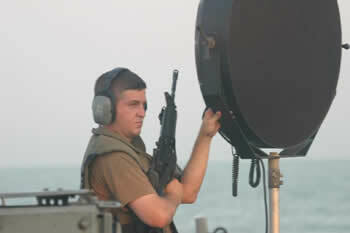 The LRAD device has been tested in Baghdad, Fallujah and New York City. The luxury cruise ship Seabourn Spirit used an LRAD to repel pirates who attacked the ship off the coast of Somalia in November, 2005.